Do Chelsea Really Need To Go Backwards? Ok, there seems to be a bit of confusion with the press lately. Maybe someone can help me out with it? There’s the odd headline suggesting Carlo Acelotti expects the sack if we don’t win the Champions League this year. Not uncommon for Chelsea I know, given that that’s the sort of headline we see most seasons and also given that Roman Abramovich doesn’t even have the patience of a good Christian, nevermind a saint. But still, I can’t really see from the interview where Ancelotti ‘hints’ at his imminent sacking. No real suggestion he’s worried about the sack as far as I can see, so I can only guess this is just the usual media circus we have to endure most seasons, with a little bit of help along the way thanks to Jose Mourinho playing games. With speculation as ever surrounding the Portugeezer, he whips it up declaring “I love Chelsea. I was the happiest man (when there). I was thinking to be there all my life and a few months later, I was out. So you never know.” But before those who still hanker after a return of TSO start wetting themselves with excitement, it might be worth considering whether it’s actually Jose Mourinho who’s really feeling the pressure of his position? For a start, he’s not running away with La Liga, not to mention being at yet another club where his boss has his own ideas about who should come and go in terms of transfers and that doesn’t sit well with Mourinho. Wasn’t everything hunky dory with us until transfers were either forced upon him or he resorted to bargain basement signings? If Mourinho’s not happy with that at Real Madrid, he certainly wouldn’t fancy a return to the same with us. Besides, Chelsea are going through somewhat of a transitional period. Whether we want to admit it or not, the side we have right now isn’t one that can win titles anymore. Come the summer, we’ll be needing a bit of restructuring and that was never Jose’s forte. In fact, if we really wanted to look at ex-managers capable of putting together a title winning side, we’d need to look a bit further back than the manager who actually won back-to-back titles. Mourinho wasn’t responsible for players like Lampard, Gallas, Duff, Robben, Wayne Bridge, Joe Cole, Glen Johnson, Crespo, Makelele and Cech. Nor can he take the credit for nurturing players like Terry, Huth and Carlton Cole but his predecessor can. In fact, whilst we can credit Jose with players like Drogba (previously recommended by Ranieri), Essien, Ashley Cole and Carvalho, we also have the likes of Del Horno, Kezman, Tiago, Jarosik, SWP, Sidwell and Boulahrouz to thank him for. Carlo Ancelotti meanwhile, has already brought us Ramires, Luiz and Fernando Torres, so, with a lot more work still required on the squad in the summer, is it really Jose Mourinho we should be hankering after? The answer is yes, because Jose can attract players, Ozil, Khadira said one of the main reasons they went to Madrid was cuz of Mourionho. This guy can get us more media attention, and makes the game more exciting. Carlo is too boring. But I still love Carlo. Jose is a great manager. He can make teams stronger. He does know who to buy and how to play them. So if a club has millions of euros to spend then jose is the best option. But he know noting about nurturing young talents. He never did that before. If our club has planned to overhaul completely buy spending pounds like old days then bring him back. And if we want to give priority to our academy jose is not the right man (nor carlo). if carlo is boring can you tell me why world class players like fernando torres and david luiz came to chelsea ? Blue Indian – the transfer market has never been Jose’s strength, fact. The title winning side was all but assembled for him and in spite of adding a couple of big players himself initially, he then set about dismantling the attacking side he’d inherited over the next couple of seasons and adding pups. Diehardchelseafan – do clubs always need the sort of media attention Jose brings with him? I seem to remember that was one of the things Roman ended up tiring of. As for attracting players, I’d say Carlo’s attracted some decent players himself already. Being able to get players like David Luiz and Fernando Torres during a January transfer window when its quite clear we wont be winning the title, is a pretty big achievement on Ancelotti’s part. All the idiots wanking themselves over Jose, I have this to say. Carlo Ancelotti is a genuinely nice man and a winner where he has gone no matter what the owners have given him. He won the double in his first season in England (Jose just wont the League cup and premier league in his first). And the football we played last year was simply mesmerising to anyone who watched it including many of my neutral friends. Jose’s football and his reputation being the cause of most of Chelsea’s negative publicity and not to forget UEFA’s hatred is all not needed. Thanks very much but I will want Carlo to remain at Chelsea for 10 more years and make us a well established club. He deserves more respect from fickle fans than this. I now know why other teams call our fans plastic – to backstab a man who brought us our first double in 105 years is just plain ridiculous. The problem is some of the overinflated egos in the dressing room. Give Drogba a good hard scolding along with Terry and Lampard and tell them that either play to your levels or play like Scholes and Giggs – sparingly for United. Don’y you guys get it? It’s not who the manager is, it’s consistency in management that’s “at fault”. All managers “inherit” a group of players and then have to make the best use of their current assets. Abramovich himself is an autocratic manager (in the true sense) – it’s his “train set” after all. He decides policy (objectives, strategies, and tactics) and it is the “figurehead” club manager who implements the tactics. Carlo didn’t “attract” Torres and Luiz. In fact Torres was on our radar way back before Liverpool had Easyjet flights to Spain. It is Chelsea and Abramovich that have attracted these players. Having said that, I think Mourinjo is the perfect “figurehead” manger for us. He was/is “the Chelsea face” in every way – we don’t need nice guys who have “won something once”. Everyone still talks of Mourinjo’s Chelsea. That was the grit in the eye of the owner. Having tried his other options,maybe Abramovich will take him back under altered circumstances. I would – he is the special one and made us special too. Nobody comes even close. Dan, I’m gonna disagree. It was Ranieri’s Chelsea (or at least the side he put together) that brought the success. The longer Mourinho stayed and the more of his players he brought in, the less successful we ended up. Statistically that cant be argued. Actually true, and that is also my point. Who is responsible for the “success” the team, the manager, or both? Roman demands results (ROI), and pretty football combined – and fast. Put another way, success using SMART objectives. The problems then arise with the different interpretations of key areas. Motivation as an example. Tribalism of the old days has diluted somewhat, and money is the main motivator a lot of the players. One of the key areas of management, amongst others, is man management and motivation. Another key area is publicity. The best manager always defends his people and is the team face to the outside World. Individual players are there to perform their best within the team. Mourinjo has that “something” that the others have not. We are lacking strong leadership (Roman’s standards) and consistency (as in the other “big” clubs). Btw your Ranieri “argument” also applies to previous managers as well – ask Gullit, Vialli, and Hoddle. Mourinjo’s legacy is still in our current team, isn’t it? If I were Roman I think I might employ Ockham’s Razor here. Maybe Mourinjo isn’t liked by everyone – but that’s just it! We are already going backwards!…Have you read the latest offering from Blue Champion? Jose coming back would be an awesome! But i would be equally happy to see Golden Guus back with us…send Carlo to Roma! But more than anyone else, i miss Ray! Carlo would concur! why dont Chelsea try a 4-4-2 with malouda and anelka on the wings and drogba/torres as our front men??? at least then we would have some width! brian…. and lampard essien in the middle? How on earth would this team be able to cope against a 4 5 1??? And I think we need to play a 451 to face Man U strong midfield. But yes, I think Carlo will play a 442. Lamps is gonna have a very tough game. Does anyone on here agree with me tht ramires hs been getting stick unfairly while he hs been constently improving deserving a spot in the team a head of the likes of obi? Sure KARMACW, Man U’s midfield is weak…. in fact, they don’t use it at all. Ball goes straight from Van der sar to berbatov who is lame but miraculously puts the ball into the net without even willing to do so. In fact, berbatov wanted to give the ball away to a friend in the stands, but slipped and scored. Sure thing, Man u midfield is weak. I even wonder why they put midfielders on the pitch (don’t tell anyone, but i have heard (secret), that they do so to make other teams think they are going to use these midfielders, whereas in fact they are nothing but decoys, a mere diversion in other words). Fletcher is not even a football player! He used to be a bartender, and as rooney is a barfly and he liked him, he had sir alex to play him! Scholes was working for a wine cellar before joining united, and he only did so because Sir Alex loves wine and owned the man’s father (who owns the shop) a good deal of money! Giggs, pfff, Giggs! well giggs in fact is taking care of the pitch the full week (because he is welsh, so lets face it, he knows about sheep stuff) and plays game for fun on the week ends. Michael Carrick even doesn’t exist! they just put a name on the sheet to make it look good. Park Ji Sung only plays so that man utd expend their market to south Korea. Nani plays because he looks like michael Jackson and the club sell tickets to desperate fans… the poor bloke even has to do a show after the game! Now don’t be such an idiot, will you? We need to be behind Carlo. Sure at times this season it seems like he didn’t have a plan B, but at the same time he had chelsea playing some amazing football last season. The other managers in the EPL may have sussed Carlo out a bit this season but I maintain that losing key players to injury and form this season is not Carlo’s fault. Now having options (new signings aside, how look lively did Zhirkov look? he should be ahead of Malouda surely) if Chelsea goes on a winning run from here with players at his disposal then surely the bad run should be put down to the players and a small squad. again. Ancelotti should be allowed time to get better as a manager in England and learn from this season WITH a squad size and selection he’s happy with. seriously… we NEED to be behind Ancelotti, I refuse to support the sacking of a manager because of 3-4 months of bad form…. its not like we’re threatened with relegation. Furthermore, with the win over Man U and spurs and city dropping points… its increasingly looking like we’ll finish third at least for an automatic CL spot. so then at the end of the season… will some of you still support the sacking of a manager that led us to 3rd in a season where we had the second smallest squad, our key players being injured with no other cover, our star striker getting malaria? 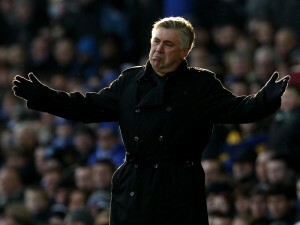 ANCELOTTI FOR CHELSEA NEXT SEASON!